Undergraduate students present their research and creative activity projects at the 2011 Symposium for Undergraduate Research, Scholarship and Creative Activity. RIVERSIDE, Calif. (www.ucr.edu) – Encouraging and promoting undergraduate research and creative activity projects is the goal of the new Chancellor’s Research Fellowship (CRF) program at the University of California, Riverside. Sponsored by the Office of Undergraduate Education at UCR, the program will award up to 12 fellowships to undergraduate students in amounts as much as $5,000 for the 2012-13 academic year. 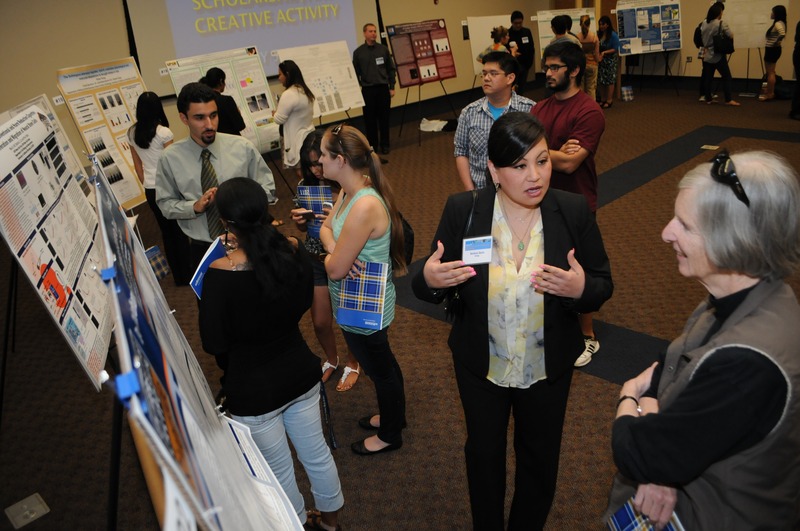 UC Riverside already has a robust undergraduate research and creative activity program, with hundreds of students participating in faculty-mentored research across the campus. 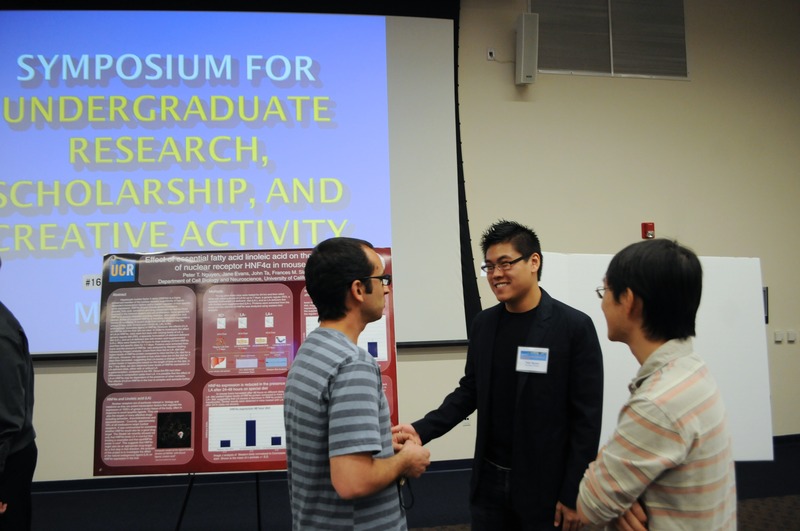 Last May, more than 80 students presented their research projects at UCR’s annual Symposium for Undergraduate Research, Scholarship and Creative Activity. Vice Provost of Undergraduate Education Steven Brint said he hopes the CRF will encourage more undergraduates to pursue faculty mentored research opportunities. “We are fortunate UC Riverside has professors who enthusiastically engage undergraduates in their research, and that the campus has facilities to support such mentorship,” he added. Oppenheim said that fellowship applicants will complete an information package that resembles a research grant application. Students must propose an independent research or creative activity project that is endorsed by a faculty mentor. Fellowship recipients will conduct the research or activity, complete a short quarterly writing assignment documenting their progress, and present their project at the Symposium for Undergraduate Research, Scholarship and Creative Activity scheduled for the first week in May of 2013. The competition will support both research and creative activity projects across all disciplines. Research projects are typical of the humanities, social sciences, and natural sciences and are developed around a research question or hypothesis, have a methodology and produce findings. Creative activity projects are more common in engineering, business, and the arts and include engineering design projects, marketing campaigns, composition of new fiction or poetry, creation of art for exhibit, or choreography of a dance performance. Fellowship funds can be used to purchase supplies, materials, software, and equipment; for travel related to the project or presentation of research; and/or to provide quarterly stipends for the undergraduate researcher. The competition is open to current sophomores and juniors in any academic discipline who are maintaining a cumulative GPA of 3.0 or above. Applications are due on April 13, 2012. A faculty committee composed of representatives of all four of the undergraduate colleges will review and score the applications. Fellowship recipients will be announced during spring quarter. More information can be found on the Undergraduate Research website. Students who receive Chancellor's Research Fellowships will be expected to present their work at the annual Symposium for Undergraduate Research, Scholarship and Creative Activity.